Recently, DICE revealed when Battlefield V players will be able to experience the battle royale mode, Firestorm. A Firestorm trailer set the release date for March 25, 2019, while also demonstrating what players should expect. However, details about the map itself were kept at a minimum. With days to go before Firestorm goes live, this has changed. 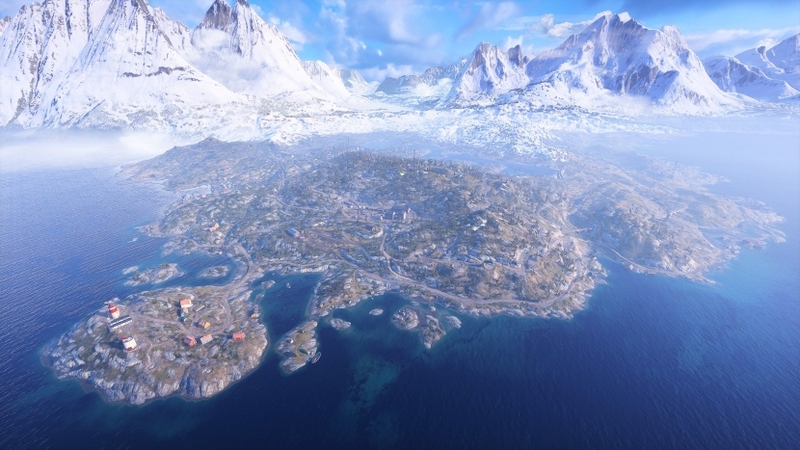 Halvøy is the name of the Battlefield V Firestorm map, and it’s supposedly the largest in franchise history. This news comes courtesy of a series of tweets on the series’ official Twitter account. The first of such tweets claims Halvøy as the biggest Battlefield map to date. A subsequent post notes that Halvøy eclipses the size of Hamada, soon to become Battlefield’s second largest map, 10 times over. Suffice it to say, players will most definitely have to rely on vehicles to navigate Halvøy, especially since Firestorm’s deadly ring of fire will keep players moving. A few of those vehicles sit center stage in Firestorm’s aforementioned trailer, where high-octane action is also shown off in spades. It seems, then, the map’s size may encourage a dependency on vehicles that many other battle royale titles lack. This is one way Firestorm will differentiate itself from similar modes on the market. Another difference appears evident in Firestorm’s player-count. While the standard battle royale experience typically places 100 players on a single map, Firestorm will only feature up to 64 players at once.